My family loves beef stew. I definitely have my go-to recipes (here, here, and here), but I also love to try new ones (like this, this and this)! 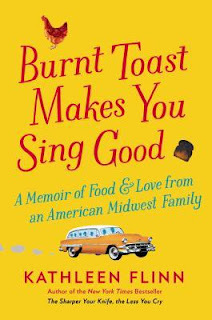 Today’s recipe comes from Burnt Toast Makes You Sing Good: A Memoir of Food and Love from an American Midwest Family by Kathleen Flinn, this month's Cook the Books Club selection. This was a slow, meandering story, intertwining the food and stories from her family. It almost felt like going home for a family reunion! 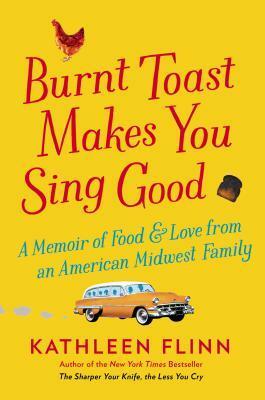 The memoir follows Kathleen Flinn’s family through several generations with stories, anecdotes and recipes. I loved this book! I also grew up in the Midwest (though a different part than the author), so I was able to relate to her and her history. Plus the recipes all sounded amazing and (again) many of them were foods I also grew up eating (with a few variations). I loved so many recipes in this book, but as I started making stew one day, I remembered this recipe and decided to give it a try. I was intrigued by the addition of the allspice and brown sugar in particular. And I was totally thrown for a loop when I kept reading and saw that it was meant to be served with egg noodles. Stew and egg noodles? Whelp, I’ll try anything once. I’ve got to be completely honest now. The stew was good. Yep, good, but not great. The noodles threw my entire family for a loop. I got a few eyebrow raises and nose crinkles. And the stew itself was just a little underwhelming. It was far more tomato-y than I’m used to for one thing and I was really missing the depth that I typically add with beer or wine. After being so underwhelmed, I let the leftover stew sit in the refrigerator for a few days before getting back to it. Happily, those couple days allowed the flavors to mellow (especially that strong tomato flavor I was so adverse to). I also ate the leftovers like I normally eat stew (in a bowl with crackers, instead of noodles) and I found I actually quite liked it! This stew needed a few days to chill out and deepen its flavors. So there you have it! If you’re up for an adventure, try the stew the over noodles or eat it the normal way with crackers. Either way, it will probably be way better after a day or two in the fridge. Stir together the flour, salt and pepper. Add the meat chunks and toss to coat. Heat the oil in a stock pot over medium-high heat. Add the meat and sear on all sides, working in batches, if necessary. Add the hot water, allspice, bay leaf, vinegar, and brown sugar. Cover and simmer for 1 hour. Stir in the beef stock, tomato paste, carrots, onion, and celery. Season with additional salt & pepper. Bring to a boil, then reduce heat to a simmer. Simmer uncovered for 1 hour. Then add the potatoes and simmer for an additional 30 minutes or until the potatoes are tender. It is a meandering story isn't it?! 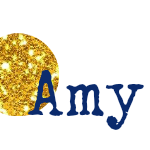 ;-) I am happy you loved the book Amy--even though I am not from the Midwest I found so many things I could relate to as well. Stew over noodles is an interesting concept and although not something you may try again, I am happy to hear that at least the stew improved after chillin' for a few days. Thanks for joining in this round of CTB and being our first entry! Strange idea stew and noodles, but I will try anything once. I prefer the idea of having it with crackers though. Sounds like a great book of memories and tastes to relate to for you. p.s. popping over from SpiritBlogs, May foodies link. I loved the book as well. Certain stews we eat over noodles, some we eat over rice and some we eat over mashed potatoes. Some we just add the potatoes to the stew but I have never eaten stew with crackers. Isn't diversity wonderful! I love stew over pasta of any kind and I guess that proves that I'm from the midwest. I like chili over macaroni too. I've still got the book to read, will pick it up tomorrow, and looking forward to it. Stew is like that, often better the day after, or even 2 days after. Of course, things can be added in the next go-around :). I also got the feeling of reading family lore that would have been shared at reunions. 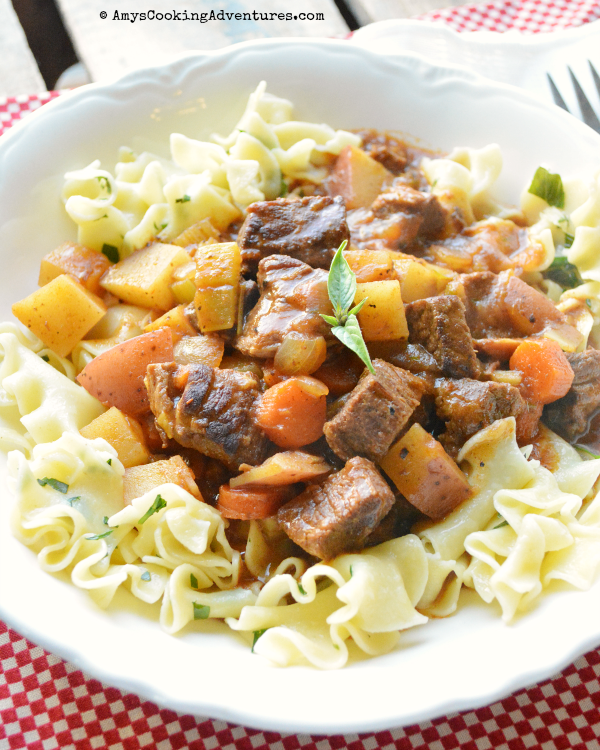 This beef stew is a classic. I be her family used the noodles to stretch out the food. It's happened to me with soups: they improve substantially when left to mature in the fridge a day or two.